Fans of Alex Hirsch’s groundbreaking animation show (aka Gravity Falls) know that there are a lot of weird things happening in the general vicinity of the town. It’s also populated with some really odd characters and seemingly normal characters. The mystery of the area is best described in three separate journals that have been hidden in different locations. When Dipper finds Journal #3 and starts using it as a journal (and studies the notes) in his quest to figure out why Gravity Falls is just so weird. 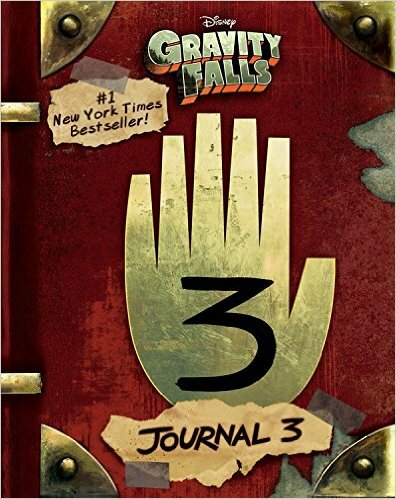 This journal is the product of some mysterious scientist and details some of his projects in his quest to determine the reasons behind the strangeness of Gravity Falls. There are also instructions for those devices, some coded mysteries AND some pictures of the various fauna (AKA baddies) in and around the town. But the journal seems to take a more sinister turn, and soon a mysterious dimension-jumper is possessing people. This was an awesome romp into one of the coolest Disney properties out there. Check it out today! It might also make a great prop for a cosplay. Who would read this: This is an all-age book for anyone who likes the show, fans of animation or those in need of a cool mystery. The journal concept is also a big draw to people! Time to Read: 5 hours, I read it in small bits and pieces here and there to properly digest it! Rating: 4.5 stars–it explained SO MUCH! Funny Story: I’ve seen people walk through various cons with these, but when I heard about this official one, I knew I needed it. Also, there’s a more interactive one, with blacklight, coming in the middle of 2017–and it’s over $100 because it has a note from creator Alex Hirsch. Final thoughts: I really enjoyed the art, the journal concept and just the fact I felt more like I was into the show! Gravity Falls is really amazing–do yourself a favor and check it out if you haven’t already seen it! If you’re interested in picking up Gravity Falls Journal #3 and want to support this blog at no additional cost to you, please consider purchasing it via this link!